Who among Smriti Mandhana and Jemimah Rodrigues has to be picked as captain? New Zealand Women clinched the 3-match T20I series following a thrilling win in the 2nd game in Auckland on Friday. The duo of Smriti Mandhana and Jemimah Rodrigues put India in a comfortable position before the middle-order collapsed yet again as India finished with a below-par total. Suzie Bates’ fifty was enough for the hosts to take a winning lead of 2-0 in the series despite a middle-order hiccup. The lack of support to Mandhana and Rodrigues has cost India back to back T20Is. The lack of wicket-taking ability too hasn’t helped India in this series. The bowlers have relied on the mistakes by the White Ferns batters rather than deceiving them with variations. The fielding in the crunch moments wasn’t up to the mark either as their mistakes in the last couple of overs in the 2nd T20I backfired on them. The third and final game of the 3-match T20I series between New Zealand Women and India Women will be hosted by the Seddon Park in Hamilton. 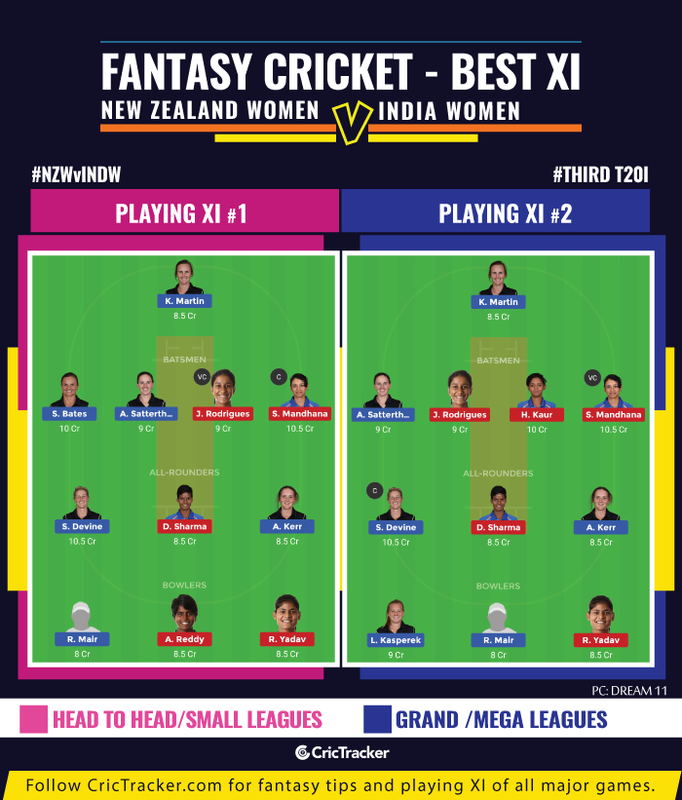 New Zealand Women: W, W, W, W, L.
India Women: L, L, L, W, W.
The surface is expected to play better for the batsmen like in the first two matches. In the last seven Women’s T20s played here, the average first innings score is 151 with scores of 130+ in all those. The hosts chased down a target of 140 against Windies last year with 22 balls to spare but lost by a big margin in 2012 while chasing 167 against England. Suzie Bates, Sophie Devine, Amy Satterthwaite (C), Katey Martin (WK), Caitlin Gurrey, Anna Patterson, Amelia Kerr, Leigh Kasperek, Hayley Jensen, Rosemary Mair, Lea Tahuhu. Bench – Hannah Rowe, Frances Mackay. Smriti Mandhana, Jemimah Rodrigues, Harmanpreet Kaur (C), Priya Punia/Mithali Raj, Deepti Sharma, Arundhati Reddy, Taniya Bhatia (WK), Poonam Yadav, Radha Yadav, Mansi Joshi, Anuja Patil/Shikha Pandey. Bench – Dayalan Hemalatha, Ekta Bisht. India might bring in one of Anuja or Mithali for Hemalatha who was injured in the previous game. Anna Patterson replaced an injured Bernadine Bezuidenhout in the squad. Dayalan Hemalatha suffered a shoulder injury during the second T20I when she dived while batting. Harmanpreet Kaur hasn’t been at her best on the tour with scores of 24, 17 and 5 from the three innings where she batted. Kaur didn’t bowl at all in the tour either. Harmanpreet has to strike big for India to end the tour with a win. Captain Options – Smriti Mandhana, Jemimah Rodrigues, Sophie Devine. Vice-Captain Options – Harmanpreet Kaur, Suzie Bates, Amy Satterthwaite. The flight Poonam Yadav gives to the batters hasn’t worked in the last couple of matches. She can be excluded given her high price-tag. India might be tempted to bring in Mithali Raj but with the series already been decided they might continue with the youngsters. India Women are expected to finish the tour with a win against the White Ferns and avoid a series whitewash.